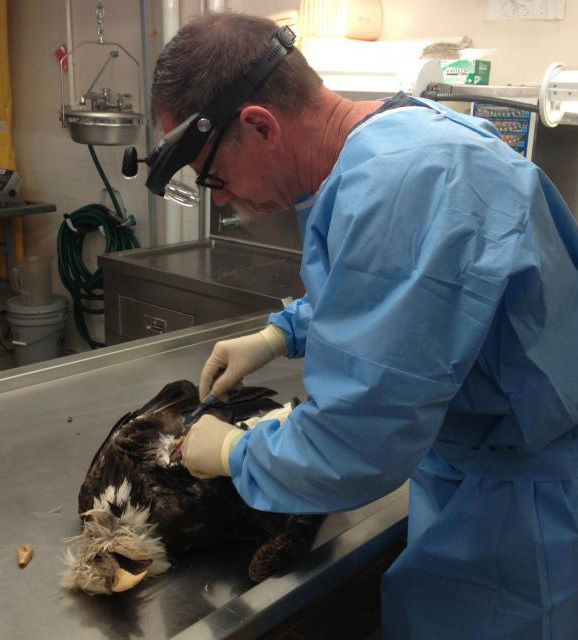 Biologists in New York state have noticed more bald eagles dying from lead poisoning, and say the leading cause is lead from hunters' bullets and shotgun shells that accumulates in the wildlife food chain, which has predators such as eagles at the end. "There were two deaths in 2009 and nine last year, and those are only the reported deaths from birds found by hikers or brought in from animal rehabilitators. The total may be higher," Angelica A. Morrison of WBFO in Buffalo and Jim Levulis of WAMC in Albany report for Great Lakes Today. “No amount of lead is normal in a biological system,” said Julia Ponder, executive director of The Raptor Center at the University of Minnesota, which tracks the deaths. The reporters write, "Eagles feast on the field dressings of animals shot with lead ammunition, which is used by hunters because of its affordability and availability. . . . Ponder said close to 90 percent of the eagles the center takes in have lead exposure, and 25 to 30 percent have lead poisoning. Most of the birds with lead poisoning die." The reporters interviewed Krysten L. Schuler, a wildlife disease ecologist with the Animal Health Diagnostic Center at the Cornell University College of Veterinary Medicine in Ithaca. "The key to solving the problem, Schuler says, is teaching hunters not to use lead ammunition for game. The use of lead ammunition for waterfowl hunting is already banned nationwide," they report.